The Book of Common Prayer was first translated into German in the early 1700's for the Church of England, and in 1847 for the American Church. These translations generally seemed to be intended for use in parishes serving German-speaking settlers or immigrants. The 1847 U. S. translation went through several printings, and was followed by several translations of the 1892 BCP, among them the one used here. Production of the U. S. BCP in German, as with most translations intended for immigrant populations, did not last past the restrictions in immigration of 1920. 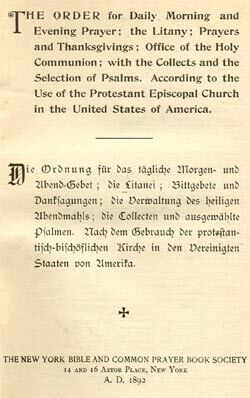 Recently, the Convocation of American Churches in Europe has prepared a German translation of parts of the U. S. 1979 BCP for use in Germany. The text used here was published in 1901 by the New York Bible & Common Prayer Book Society, and contains only a portion of the 1892 BCP. It consists of the English text on the left-hand pages, and German on the right. Like all German BCP translations, the text is in 'fraktur', the old-style German typography. An example of the text may be seen in the Litany. There is no certificate or any other indication of official sanction. This book appears in David Griffiths' Bibliography of the Book of Common Prayer as 40:21. Close examination of the text will show that it does not always follow the 1892 BCP exactly; there are aspects of the 1789 BCP in certain places in the text. We also have an ealier version (Griffiths 40:20, title page pictured above), published in 1892, which is essentially identical except that it omits the occasional offices (Baptism and following). This 1892 text is available from Google Books. The Articles of Religion were taken from an earlier German BCP published in 1861 (Griffiths 40:14). We also have the entire 1901 book as PDF graphics. There is extractable text, but this has not been proofread and undoubtedly contains errors - particularly in the German fractur trext. Those knowledgeable in German will quickly note that the spelling of a number of words is different in this text than it is now; for example the word tun and all its forms appears as thun, dass appears as daß, etc. If you see any other errors or typos, I would very much like to hear of them. Thanks to Dorothee Irmer for proofreading the German text.